Typifying the ubiquitous bungalow style of the Midwest, the Youngman Residence is a finely restored 1920s house. The current owners are Arts & Crafts aficionados and have filled their home with exquisite period antiques and Stickley reproductions. The antique fireplace mantel piece with its unusual prow shaped cabinet, salvaged from a home in Blackpool England, dates from ca 1885 and is a fine example of the English Arts & Crafts movement. 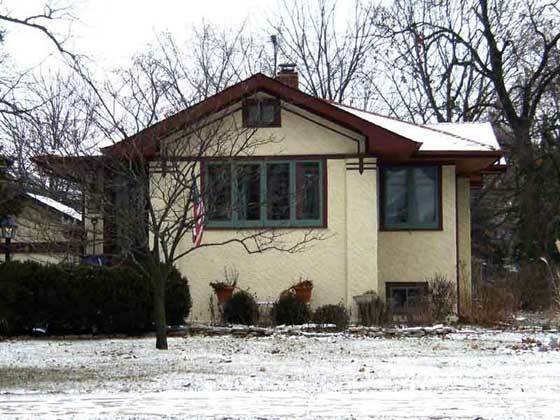 This structure shows influences of the Prairie School in its design, with a band of windows in the front and wide overhangs of the roof on both sides of the house. The living room has a lovely view of the surrounding area because the house is sited on the lot to allow light to flow into the interior, uniting the exterior and interior spaces.